So what does it cost to make a screen - one of the most common questions asked - so we'll make it straight forward and easy for you and put all the costs on the table so you can make an informed decision which screen methods is best for you. Before you start, just remember that there are a lot of factors that go into make the overall cost. We will try to detail them all, so if some do not apply to your situation so remove them, however it's important we let you know all the costs involved straight up, so there's no hidden surprises later. 1. 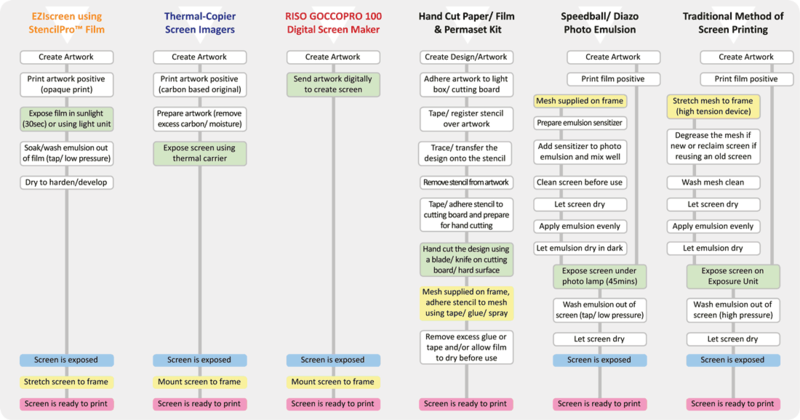 Screen Creation - the cost of materials taken to create the screen. 2. Time - a screen for $5 is no good if it takes 2 days. You need to find the balance between cost and time taken. 3. Equipment - What's the overall cost of setting up equipment, can you reuse screens, do you have to purchase additional equipment for screen removal, there's always hidden factors and costs in this area that most manufactures will not tell you! 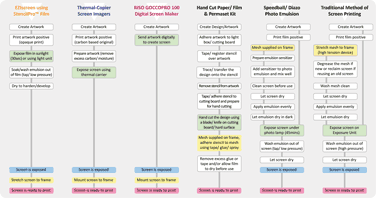 Exposure methods can be divided into two main categories. 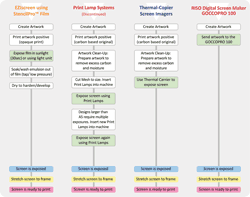 View the chart showing all methods (right), or see individual charts below to view emulsion and thermal comparisons separately. The way a system creates a screen will involve a series of steps, each involves a cost and/or time factor. All these steps combined add to your overall costs and should be considered, even is not counted or costed, before you invest in equipment long term - one day you may have to start accounting for the additional costs incurred! Why isn't the 'Permaset Fabric Kit' compared? Permaset fabric kit is designed to sell ink, not support an ongoing screen printing operation as it uses a hand cut paper stencil with no real screen creation. This is not real screen printing, but a toy to let you print a design or two that's it. You get the same result using a cardboard stencil and spray, this kit just allows you to use the Permaset Fabric Inks instead of the spray. It's a novice stencil product and OK for beginners, but we don't call it an actual screen printing system that requires screen creation using exposures. The printing process is screen printing using a squeegee, however we only compare 'actual' screen printing methods where you receive a professional result and designs are not limited to block text or solid graphics. The limitations of Permaset just do not allow halftones or fine lines, both possible with any of the other compared methods. If your interested in this type of equipment, then your only ever going to receive a novice/ basic print. For the full breakdown and detailed costing - click here . . 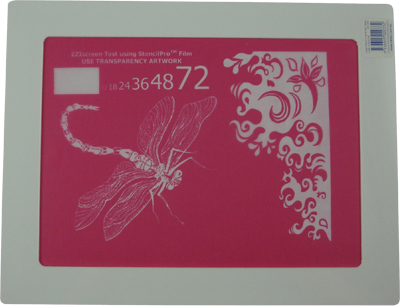 Artwork costs not included, as two people using the same system can have different costs based on the printer type they use (laser or inkjet), the transparency film used, etc. Where multiple sizes/ volumes of products are available, cost listed above is the lower cost based on purchasing the higher volume item, i.e. 10 pack, or 1L of emulsion/ cleaner. Time - did you calculate this? 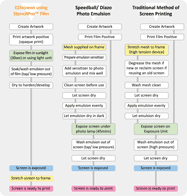 Did you think about costing the time it takes to make a screen? Probably not unless your running a business or going to sell the items you print. Overall time from idea/ start to actually putting ink through the screen is very important, as having a low screen cost is not that great if it's going to take your hours to create the screen to begin with. Below is a chart of times for each method. For full details click the time to view the individual breakdown. So now we know the cost of a screen and the time taken to create that screen (above), let's cost out an A4 screen and value our time at a home business style $20/hr? Imagine if your having to pay $30 per hour? 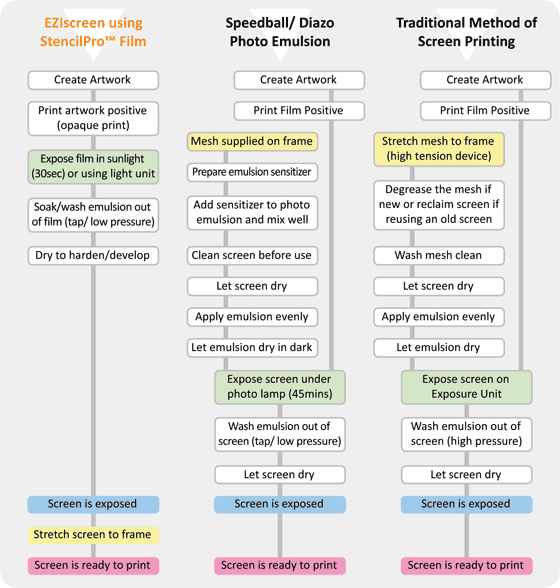 So if your running a business or wanting to make some $$ return on our investment, that above quickly tells you that opting for a cheaper system may not be cheaper every time you make a screen, in fact you only have to make 2-3 screens and EZIscreen has already repaid it's investment over Speedball using Diazo! Is this eco-friendly? Can I do this at home around kids? - What are you washing down the drain and what equipment are your throwing out after making a screen? If your degreasing and reclaiming screens then the solvents your using are not likely to be eco-friendly (they are chemical solvents), even the Speedball instructions tell you to wear rubber gloves! Can I re-use my screens? 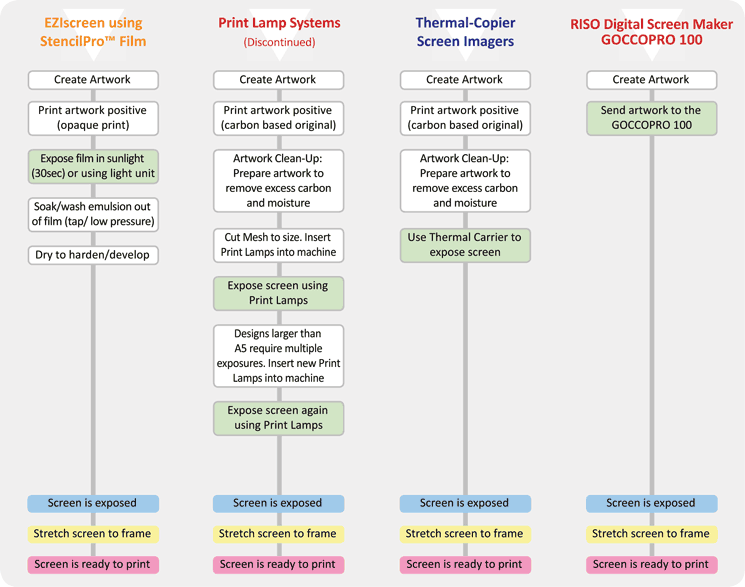 - If you can't store and reuse the screen after you have finished with it, then if you want to come back and re-print it again your going to have to pay all over again to have it made for the 2nd time. This can be pretty costly if it's just for a few more prints. - Pinholes are small specks that open up and need to be corrected by reblocking the screen. Normally caused by poor artwork or gaps between artwork & screen with emulsions. - Can you do this at home (or office/ warehouse) or do you need to purchase a professional washout bay to trap the chemicals before they go down the drain? ” Print lamps are not eco-friendly. Emulsions use solvent cleaners that should not be washed down household drains. Of course there's many more variables than those listed above, however have a read of blogs and forums on the internet and you'll quickly find people sharing their experiences of the good and bad.